A message sent to affected developers said that Apple was removing gambling-related apps made by individuals in an effort to “reduce fraudulent activity… and comply with government requests to address illegal online gambling activity”. Some of the removed apps are now coming back online. “Apple says these apps contain gambling but they don’t reveal how they have detected this,” said Simon Stovring, a Copenhagen-based developer behind a gif-sharing app called Gifferent. “It seems like an unfortunate but honest mistake,” he told the BBC. Mr Stovring said about 10 fellow-developers had contacted him to say that they too had been hit by the ban. Wojtek Pietrusiewicz, co-owner of the Polish app iMagazine, said it had also been “caught in the crossfire”. 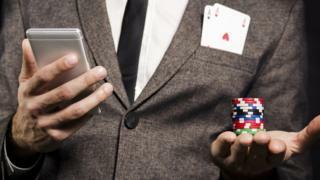 He said he thought the removal might have occurred because the app contains access to the wider internet, which allows users to potentially click through to gambling content. The app, which has thousands of users, was down for a total of 15 hours. While it didn’t cause any serious issues, Mr Pietrusiewicz said it did result in “one angry comment from a reader and a lot of stress for our team”. Another developer, Niall Watchorn, also watched as his app for sharing Xbox game footage was reinstated after several hours. “It was very frustrating though, as my app has just started gaining traction,” he told the BBC.